This kitty-corner pair of music stores is frequented by those who relish the thrill of the hunt. Musical notes dance across the front facades, and a strung up French horn serves as a sign. 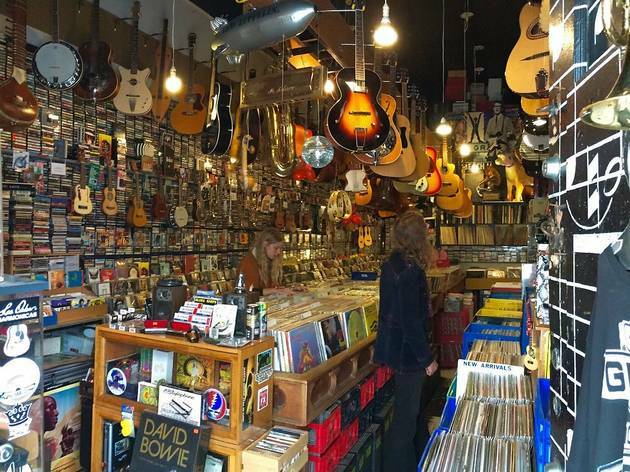 At the Grant Street shop, neighborhood regulars and North Beach tourists flip through the record stacks under a canopy of dangling guitars, ukuleles, banjos and disco balls. Though 101’s organizational system leaves something to be desired, there are gems to be found among the crates, particularly in the jazz and rock sections. 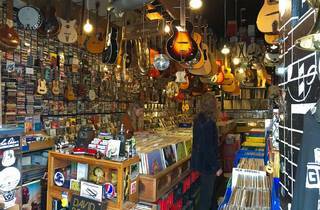 Across the street, the 513 Green Street address sells a wide variety of musical equipment, instruments and stereos. But the real draw is the infamous basement, a narrow warren of over 50,000 dusty, unsorted records priced at $5 apiece.